NAFCO testing laboratory is compliant with the requirement of ISO/IEC 17025 : 2005 and being accredited by TAF; Meaning that NAFCO laboratory is fully certified on both technical-testing ability and management system requirement, and those are essentials to fulfill the validity of testing result and precision of equipment calibrations for our esteemed customers. 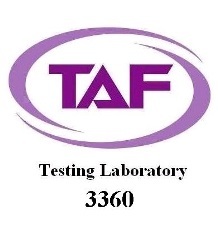 Note :Abbreviation TAF stands for Taiwan Accreditation Foundation, which is the sole accredited organization by Government to certify inspection facilities or laboratories in Taiwan. .